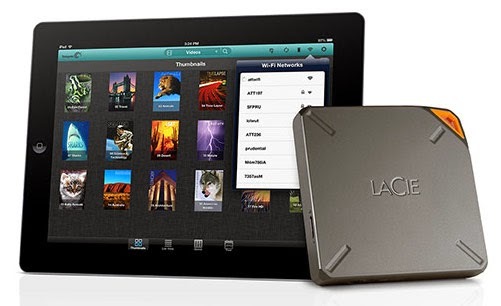 Lacie FUEL - 1TB Wireless Hard Drive seems like the perfect choice for a backup drive for your Mac or iPad/IOS device. (According to the manual it can also be used with Windows and Android devices). Its not the only choice (See CNET's review of WIFI hard drives.) but seems fairly easy to setup and can be used while connected to the internet. I'm a little disappointed that Lacie does not recommend using the FUEL as a TimeMachine Backup for your Mac, but the ability to use it with multiple devices at the same time is a definite plus. Load your media quickly. Your LaCie Fuel includes a USB 3.0 port for fast transfers, up to 5Gb/s. To take advantage of the faster transfer rates available to USB 3.0, plug your device into a Windows® or Mac® computer with a USB 3.0 port. The LaCie Fuel can be connected to a USB 2.0 port but transfer rates will be slower, up to 480Mb/s. Share content with more people. Your LaCie device can stream up to three or more Wi-Fi enabled devices at the same time, so more than one person can access your wireless media library at the same time. Do more. While you’re listening to music or viewing movies or photos on your mobile device, you can also browse the internet from your home network or your favorite Wi-Fi hotspot. Manage your digital media files. Use the Seagate Media™ app to play your music in the background, personalize your photo slide shows, add movie bookmarks, and more. Synchronize your media files. Automatically synchronize all your media files with your LaCie Fuel using the free Seagate Media Sync™ software. The Lacie FUEL costs $199. The website says currently out of stock but available soon.